Rep. Frank Farry (R-Bucks) today welcomed the Neshaminy High School Girls’ Soccer Team and its coaching staff to the state Capitol, where they were honored in the House of Representatives for capturing their first state title in the 2013-14 PIAA Class AAA state championship game held in November at Hersheypark Stadium. 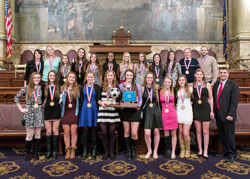 HARRISBURG – State Rep. Frank Farry (R-Bucks) today welcomed the PIAA Class AAA State Champion Neshaminy High School Girls’ Soccer Team to the state Capitol, where they were officially honored on the floor of the House of Representatives for their outstanding athletic achievements. The girls and their coaches were recognized and presented with a House of Representatives citation. In November, the team captured its first state championship title after a 2-1 victory in overtime against Spring-Ford High School. The Redskins finished the season with a record of 25 wins and 0 losses. “It was truly an honor to recognize this fine group of scholar athletes for their historic victory,” said Farry. “The determination these girls displayed on the field has made our community proud and it was a privilege to host them at the Capitol as they received the accolades they so wholeheartedly deserve. In addition, the team has been nationally recognized for its academics and has an average GPA of 3.67. The Neshaminy Girls Soccer Team players include Jessica Kelly, Holly Bowser, Sarah Hertenberger, Shannon Fisher, Katie McCoy, Amy Mandia, Katie Suchodolski, Gabby Farrell, Stephanie Donahue, Nicole Nisivoccia, Alyssa Antonelly, Julia Andreozzi, McKenna Mullin, Megan Schafer, Lauren Morris, Alyssa Tobin, Fran Donato, Maggie Daeche and Amy Heller. A group of supporters, which included parents and school officials, accompanied the team on the trip to Harrisburg.